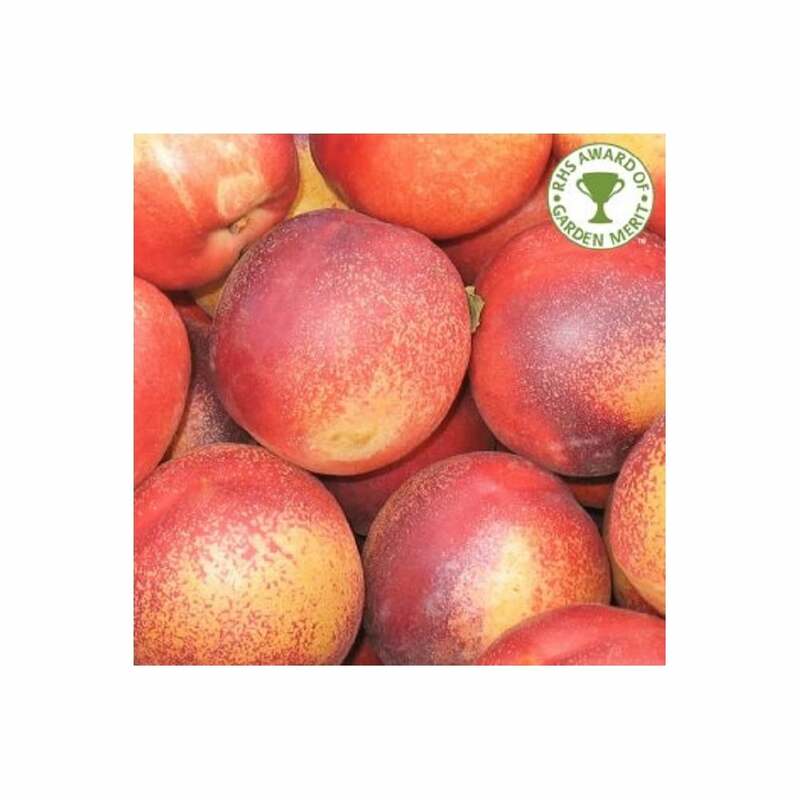 Lord Napier Nectarine trees produce large nectarines that have smooth dark crimson skin flecked with yellow. The very pale, juicy flesh has a satisfying taste and is suitable for both eating and cooking. As a self fertile tree, Lord Napier does not require another Nectarine tree to pollinate the pretty pink spring flowers. It is best planted in a south or west facing position with full sun. *Indication of the un-pruned height of this variety of Nectarine tree in 10 years. Variations will occur due to planting position, pruning, geography etc. Our pot grown Lord Napier Nectarine trees can be planted at any time of the year, whereas bare root nectarine trees need to be planted November-March. Nectarine and peach trees should be spaced at approx. 3 metres between trees. Gently loosen the roots and place into the planting hole. Using 50% of the original soil and 50% compost, fill in the hole and firm around gently, taking care not to bank soil up around the collar of the tree. We recommend planting nectarine trees using a stake and tie kit and rabbit guard. For further information, watch our how to videos. If you’re planting nectarine trees in spring, summer or dry weather, water well and regularly for the first few months. Keep an eye on young fruit tree and increase watering if there are periods of hot or dry weather. If you’re planting in autumn, you may only need to water a little. Once you see the fruit begin to swell, water again. We stock a range of irrigation kits to assist watering. Keep the area free of competing weeds and grass for the first couple of growing seasons. Unlike some of our fruit tree varieties, nectarine and peach trees should not be pruned whilst dormant. The best time to prune nectarine trees is after the coldest part of the winter has passed but before they start to flower. February is normally a safe time, depending on how severe the winter has been. When pruning nectarine trees, aim to have 3-5 main branches forming an open, vase-shape. Both nectarine and peach trees fruit on 1 year old wood, so remove old shoots (grey in colour) as they will not produce fruit. Also remove damaged, dead or diseased branches. Ensure the centre of the tree is open, allowing air and sunlight to reach inside. The tree may look a little gappy, but will improve soon with the spring flowers. The branches that are one year old will be pinky red in colour and should be trimmed back to approximately 45cm in length.